Citation Information: J Clin Invest. 2018;128(3):1164-1177. https://doi.org/10.1172/JCI97103. 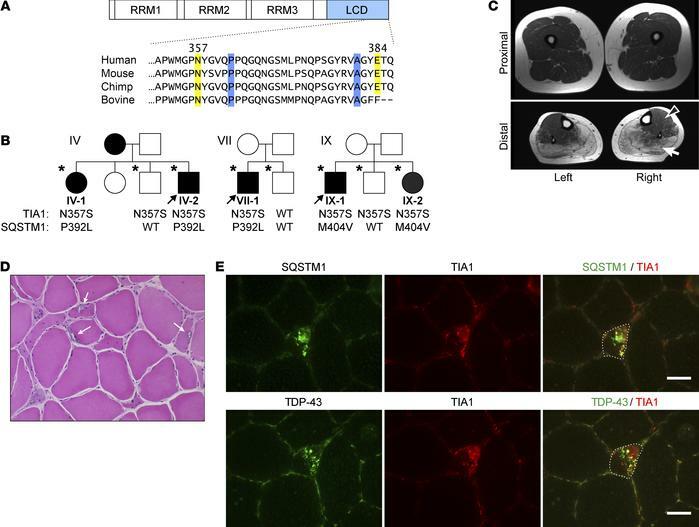 Digenic inheritance of SQSTM1 and TIA1 variants leads to distal myopathy with RV-IBM pathology. (A) Linear diagram of the TIA1 protein highlighting conserved regions of the LCD. Distal myopathy–associated variant positions are shown in yellow and ALS and FTD variants in blue. (B) Pedigrees of families IV, VII, and IX showing segregation. DNA was only available for the patients indicated with an asterisk. (C) Muscle imaging findings for patient V-2 at age 54 years. Severe involvement of all calf muscles was seen on MRI T1-weighted images. The solid white arrow indicates normal muscle, and the arrowhead indicates atrophic muscle with fatty replacement. (D) H&E staining of a muscle biopsy of the right tibialis from patient XII-1 showing several fibers with RVs (arrows). Original magnification, 50 μm. (E) Immunofluorescence staining of TIA1 (red) with SQSTM1 (green in upper panel) or TDP-43 (green in lower panel) revealed accumulation and partial colocalization of these proteins in the muscle biopsy from patient V-2. Both sets of images show a RV fiber. The dotted lines denote affected fiber. Scale bars: 50 μm.